This armoire was introduced about five years ago and has proved to be quite popular. Six have been made. Five went to the West Coast hence, "Cali Cab." It is of very substantial size and construction, see the dimensions below. Black walnut and curly maple from a small mill in northern Pennsylvania, locally sawn and dried. Wenge pulls, case splines, and mortise pins in the stand. 9- two inch drawers, 3-three inch drawers, a single five inch drawer. 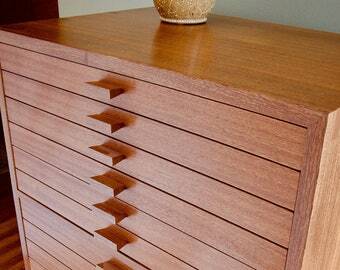 Dovetailed drawers, silky smooth wood on wood drawer action. Cabinet is mitered and reinforced with four dovetail wenge splines in each corner. Upper drawers(2" outside ht, 1.5/8" inside ht.) are ideal for jewelry, or the dividers may be removed and the drawers used for lingerie. The lower three inch deep drawers are suitable for larger bracelets, watches, etc, or lingerie, scarves, etc. All drawers are lined with black cotton velvet, with removable and adjustable solid ash dividers. Drawer dividers vary from 2"x2" in the shallower drawers, to much larger spaces for bracelets, large necklaces, watches, and boxed jewelry or eyeglass cases. The top drawer has a ring cushion. Cabinet is 36"ht, 18"deep, 24"wide. Total height with stand is 48." Stand is standard mortise & tenon construction, 12" ht. 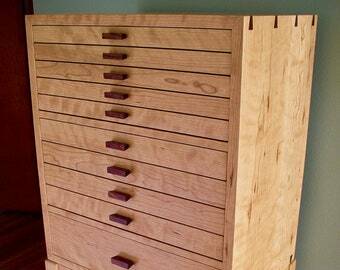 Cabinet and drawers are finished with eight coats of pure shellac and hand rubbed to a high sating sheen. Cabinet is attached with brass screws to threaded inserts installed in the base. More images are available; including divider details. Send me your email address and I can provide them. (These images are not the actual cabinet; it is, however, the same species, proportions and size. The drawer layout is slightly different, as described above). 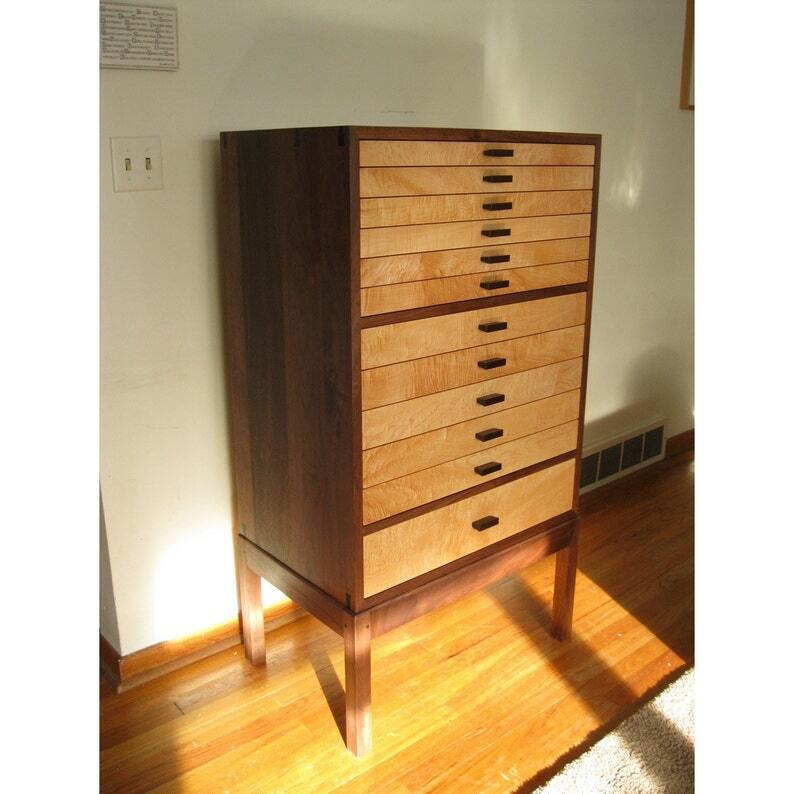 May be custom made in a variety of sizes, species, and drawer configurations. This type of cabinet can also be specified for many applications. The drawers and dimensions can be customized for mineral or natural specimens, sheet music, architectural plans, flat files, or any large format storage requiring safe and easy access. Custom crated, worldwide shipping available. Contact me for a quote. Contact me for more details and images.